While flipping through the H&M circular, a boy's T-Shirt with Printed Design caught my eye because it features a giant letter B (my favorite letter) with a lime green border (my favorite color) and NYC's cityscape with the Empire State Building juxtaposed inside it (my one and only city) so of course I had to go check it out. The largest size fits really snug on me but I left with it anyway since it's only $9.95 and with the Wrapp app (highly recommended for coupons), I left with it for just $4. Pairing it with a blazer makes it versatile enough to wear to work and also on casual weekends under a comfy zip. 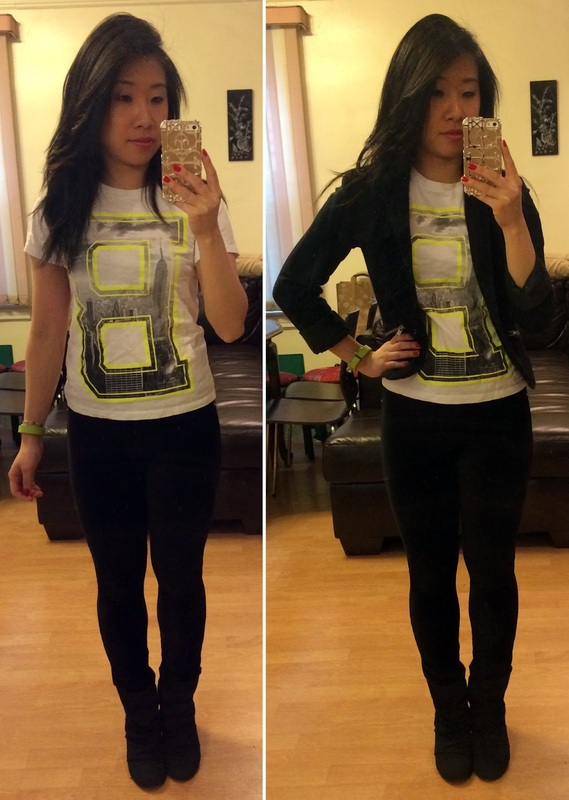 Tee: H&M T-shirt with Printed Design. Pants: MICHAELMichael Kors Petite Straight Cord Leggings (sold out now but brown version in reg sizing here). Booties: Aldo (old but similar here). I actually just purchased the MICHAEL Michael Kors Petite Straight Cord Leggings recently and have to say I am impressed with the fit and sizing. I wasn't expecting much but the cord material really does keep me warm in chilly weather while being very sleek and the bright silver rivets on the back pockets is a nice touch. They are a tad long but I have no problem wearing these without a visit to a tailor. They are unfortunately sold out already but a brown version in regular sizing is still available here. I've made a mental note to keep an eye out for this brand if I'm in need of any more pants, which shouldn't be in the near future, but who knows? 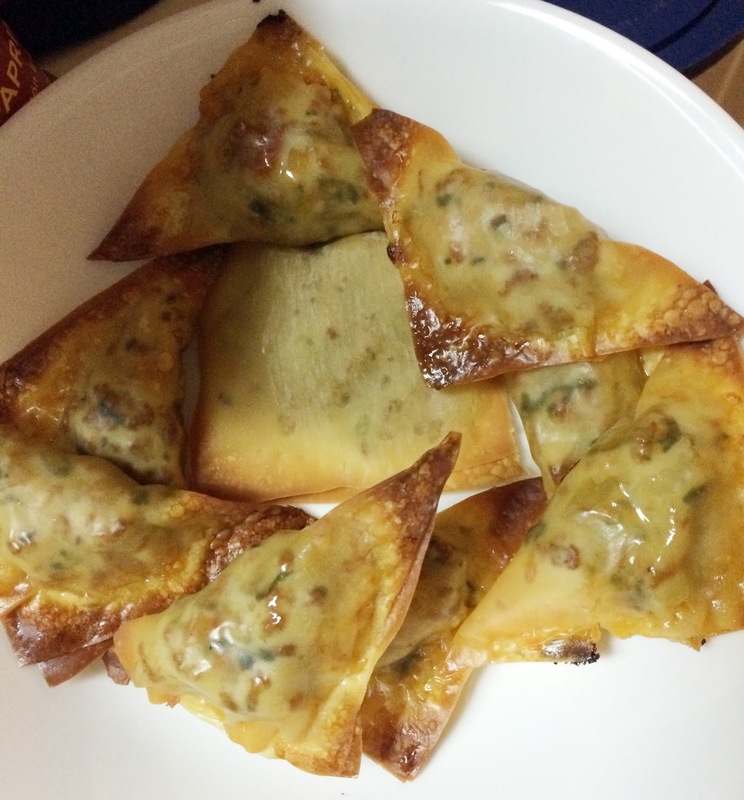 As mentioned in my previous post, I am a big fan of Mind Over Munch's wonton skin recipes and this one is my favorite. They taste delicious and the special sauce tastes and looks just like Thousand Island dressing but is made of yogurt and is only 5.5 calories per tablespoon! I can see myself using this sauce for sandwiches, salads, and as a dip. 1. In a skillet over medium heat, cook onions and garlic in oil. 2. Add ground turkey, breaking up the meat as it browns. 3. Add spinach, tomatoes, pickles, garlic/onion powder, paprika and salt and pepper. 4. Cook 6-10 minutes, until meat is cooked and spinach is wilted. 6. Assemble bites, filling each wonton with 1 tsp of meat mixture and 1/2 tsp low fat cheddar. Using your finger, brush water along the sides of the wonton wrapper to help seal as you press ends together. Use a fork to crimp along the edges. 7. Brush egg white on wontons and place on baking sheet lined with foil and sprayed. 8. Spray with cooking spray and bake for 8-12 minutes, until browned and crisp! Leaving you with the fortune cookie quote, "Try not to stand on your own side during an argument."